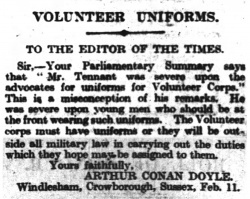 Volunteer Uniforms is a letter written by Arthur Conan Doyle first published in The Times on 13 february 1915. Sir, — your Parliamentary Summary says that "Mr. Tennant was severe upon the advocates for uniforms for Volunteer Corps." This is a misconception of his remarks. He was severe upon young men who should be at the front wearing such uniforms. The Volunteer corps must have uniforms or they will be outside all military law in carrying out the duties which they hope may be assigned to them. Windlesham, Crowborough, Sussex, Feb. 11.